This week on episode 461 of the Dread Media podcast, I wrap up my three week salute to Christopher R. Mihm and the Mihmiverse with The Late Night Double Feature (2014). 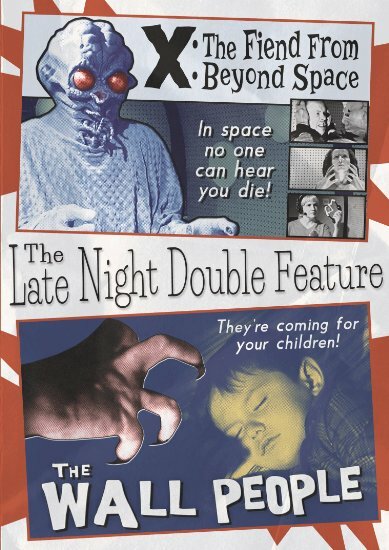 You get a good old fashioned double dose of terror with X: The Fiend from Outer Space and The Wall People! As always, be sure to check out www.sainteuphoria.com for all things Mihm, starting off with the trailer. There are a lot more classic flicks to choose from and be ready for his latest movie, Weresquito: Nazi Hunter, scheduled for release this fall! 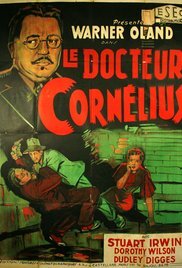 Plot: Dr. Paul Cornelius is present as thief Joe Valerie is near death in a hospital. Valerie stole a million dollars years earlier and offers to tell the doctor its location in exchange for death to end the pain. Later, an old woman hears of Valerie’s death and rejoices as it means she is finally free. She had promised Valerie to watch the money and has been housebound ever since. However, just as she climbs the stairs to get the gold, she see Valerie’s face and falls to her death. Meanwhile, police detective Dwight Wilson meets clairvoyant Patricia and soon enlists her help to solve the murder of the old woman, just as Dr. Cornelius’ evil plot begins to unfold. Personal Thoughts: This flick is definitely more mystery and thriller than horror but the creepy atmosphere of the old dark ghost adds to the fun. Having been a longtime Warner Oland fan, it’s always entertaining to watch him play a more sinister role, vastly different from his Charlie Chan films. While the rest of the cast is greatly unrecognizable, all the usual elements are there. Here, instead of a reporter it’s a policeman who is falling for the young woman, who is a clairvoyant, a popular theme of the day. There are secret passages, with a unique twist, and all of the standard bumps in the night. But, it’s all well done and definitely worth an hour of your time. Oland’s presence elevates this film from obscurity. Trivia: A Pre-Code film that really doesn’t push the limits too much. The closest might be a couple deaths in the walls but even those are pretty tame. Never released commercially, it can be found sometimes through various sources. It is currently available for rent or purchase on YouTube. The film print available is generally good and worth adding to your collection. Before Dawn shows up from time-to-time on Turner Classic Movies. On June 10, it was time for another trip to Liberty Hall in downtown Lawrence as Darrell Brogdon was presenting two more wonderfully fun and creepy flicks from the past as part of the Cinema a Go-Go series. 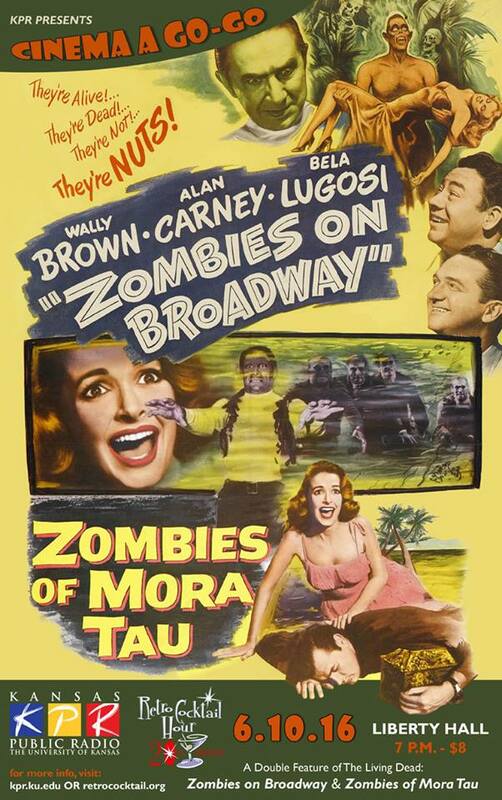 This time, it was all about zombies with a double feature of Zombies on Broadway (1945) and Zombies of Mora Tau (1957). First up was Zombies of Mora Tau, a Sam Katzman produced effort starring Alison Hayes from Attack of the 50-Foot Woman (1958). Directed by Edward L. Cahn (Invasion of the Saucer-Men, It! The Terror from Beyond Space), this had to do with a group of dead crewman from a sunken ship trying to protect some legendary diamonds from scavengers. It had plenty of atmosphere but the hilarious script and amusing underwater special effects offered up a mixture of charm and laughs. 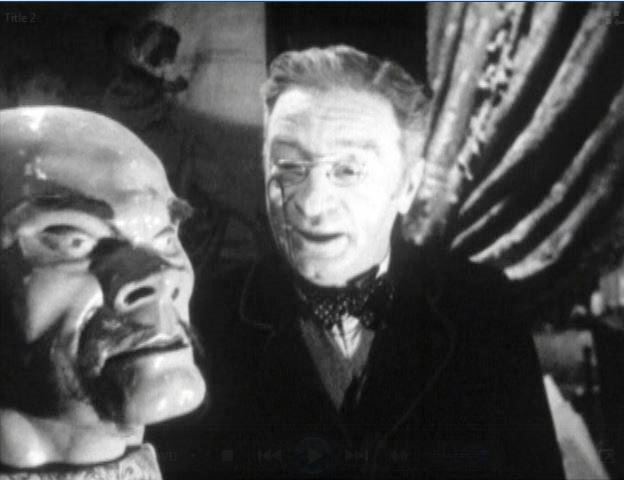 The on-screen prologue talks of darkness and ancient worlds, as well as mentioning the twilight zone and the walking dead, long before either phrase spawned a popular series. It was originally part of a double feature that also included The Man Who Turned to Stone, a lesser effort that would have made Zombies of Mora Tau look more impressive that it really was. That said, it was the perfect film for the Cinema a Go-Go crowd, with laughter and comments at all the right moments. Definitely a film better seen with a group but it is available on DVD as part of the Icon of Horror Collection: Sam Katzman box set. After a brief intermission and the usual prize giveaways, it was time for the second half of the double feature…Zombies on Broadway! Bela Lugosi heads up the cast but by this time, his name had lost its star power. He was still three years away from his brief resurgence in Abbott and Costello Meet Frankenstein (1948). Sadly, his co-stars here are Wally Brown and Alan Carney, two low-rent Bud and Lou copycats. The crowd didn’t quite seem as into this feature and for good reason. It’s a bit of a chore to make it through. It’s not horrible but there are some offensive black face sequences and racially motivated humor. It all must be taken into consideration of the time period it was made. That said, not horrible and seeing Lugosi on the big screen is always fun. It’s currently available as part of the Karloff and Lugosi Horror Classics DVD set. My daughter Kayla loves these events and this time around, her husband Drew tagged along. He wasn’t scared off, so there’s hope he’ll be back for the next event in late August. As always, Darrell Brogdon puts on a great show. 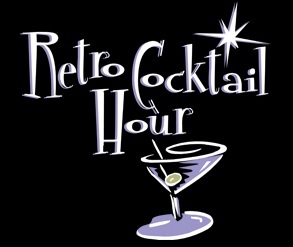 His weekly radio program, The Retro Cocktail Hour (two of the greatest hours on radio each week), recently celebrated its 20th year on the air. These events are a lot of fun and I highly recommend you check them out if you are in the Kansas City and Lawrence areas. This week on the Dread Media podcast, it’s part two of my three-part series taking a look at the Mihmiverse. Christopher R. Mihm is the writer, producer and director who has envisioned a series of films that are loosely connected, either by places, characters or familiar faces. They are made as a homage to those great sci-fi and monster flicks of the 50s, complete with monsters in suits and corny dialogue, filmed in glorious black and white. This week, it’s time for a giant bug flick in the vein of such classics as Them! (1954) and Tarantula (1955). 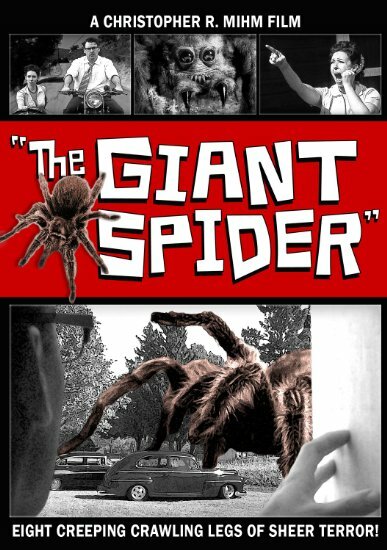 The Giant Spider (2013) won the Forest J. Ackerman Film Award at the Famous Monsters of Filmland Festival in 2013. So, sit down and listen to episode 460, then check out the Christoper R. Mihm website at www.sainteuphoria.com, where you can find all of his movies in addition to posters, lobby cards and more! Plot: A mysterious monkey paw finds its way from owner to owner, leaving a trail of death. After tragedy befalls a shop owner, a mother wishes for the return of her dead son. Is the wish granted and what are the consequences for a making a deal with the monkey’s paw? This classic tale always works better as a short story and, in my opinion, as a radio adaptation. The story has some horrific elements but usually only implied, never seen. Stretching it out to an hour’s length or more, as is done here, just results in a lot of unnecessary padding that drags out the story. This version never really gets going until the last fifteen minutes. It’s well done on an obvious low budget but does appear rather like a stage production at times. Worth seeing but I wouldn’t pay too much for it and there are a lot of other better versions out there. Check out this BBC radio adaptation from the Fear on Four series. It works much better. Sidney Tafler is as well-known British after with more than 50 credits to his name, even including a visit to the James Bond universe with a role as a captain in The Spy Who Loved Me (1977). 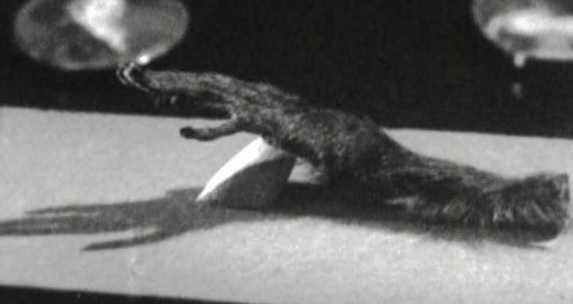 The Monkey’s Paw has been filmed countless times, from the silent era to as recent as 2014, sometimes as a short, sometimes as a full film. It’s also been featured on many anthology series on both television and radio. Never released commercially, it is available as burn-on-demand DVD from Sinister Cinema. The 16mm print isn’t bad but the heavy accents are hard to hear from time to time. This week on the Dread Media podcast, I start a three-part series taking a look at the Mihmiverse. Christopher R. Mihm is the writer, producer and director who has envisioned a series of films that are loosely connected, either by places, characters or familiar faces. They are made as a homage to those great sci-fi and monster flicks of the 50s, complete with monsters in suits and corny dialogue, filmed in glorious black and white. 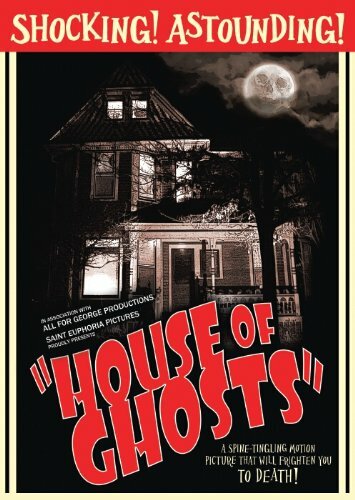 First up is House of Ghosts, which won the coveted Rondo Hatton Classic Horror Award for Best Independent Feature in 2012. You’ll swear William Castle was involved as you watch the story unfold. So, sit down and listen to episode 459, then check out the Christoper R. Mihm website at www.sainteuphoria.com, where you can find all of his movies in addition to posters, lobby cards and more! June 13 marks the tenth anniversary of The Basement Sublet of Horror. For a decade now, the program’s host, Gunther Dedmund, has entertained us from his basement apartment. He’s unearthed such “classics” for us to peruse as Atom Age Vampire, Teenagers from Outer Space and Monster a Go-Go. Yet, little is known about Joel Sanderson, the man behind the camera. Joel usually lets Gunther hog the spotlight but today, we have a very rare event. Both Joel and Gunther have consented to sit down for their very first interview together. Joel and Gunther, welcome to Monster Movie Kid. It’s an honor to have you both here to celebrate the 10th anniversary of The Basement Sublet of Horror. Joel, let’s start with you. How did all of this begin? Where did you find the inspiration for the program? Joel: The Basement Sublet of Horror television show began in 2006, but its’ part of a long-running project of movie shows that began in 1989. The earliest shows were based more on the movie going experience with a healthy dose of nostalgia for bad movies, along with educational movies. The first movie show was an outdoor drive-in themed party called The Escape’ Drive-in, which was followed by an indoor stage show called M.T. Pockets Budget Film Fest. Both shows had live music and prizes. The Basement Sublet of Horror grew out of those shows, becoming the television version and taking on a horror host theme as that was the most economical way to produce a show. It’s a take off of the horror host program that I grew up with in Wichita, Nightmare with The Host and Rodney. Gunther, what is it like to have your home opened up for all to see? 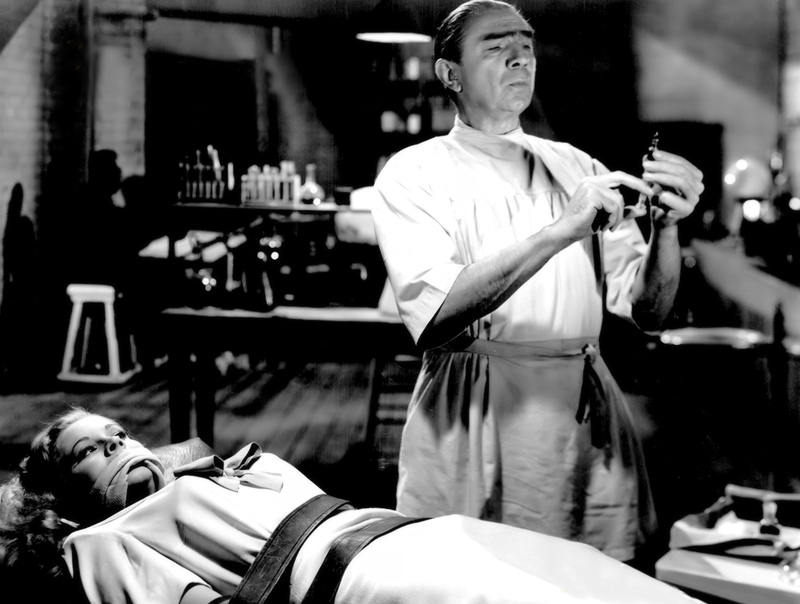 Do you really enjoy welcoming everyone into your home to watch these classic horror flicks? Gunther: Not at all, my reputation as a total recluse is fairly well known. I can’t stand people wandering through my apartment fiddling about with my things. I’m much happier watching the movies alone by myself with pleasant snacks as my only companion. How do you select the movies for the show? Is there a particular quality the film has to have? Joel: The main quality the film has to have it that it is available for free as the show doesn’t really have a budget. Anything that can be done to cut costs is taken advantage of. There is an incredibly huge number of available public domain films to choose from and we pick the ones that either seems to fit the show or have enough interesting information that can be gleaned to have something to talk about during the hosting of the show. What goes into the production of a standard episode? Joel: The earlier episodes were very time-consuming, mainly since I’d also completely re-cut and condense the films down to fit the then format of one hour. I’d also inter-splice additional film excerpts that would either make a comment on or make fun of the feature films. Over the years, the show’s format changed to ninety minutes in a format where the entire feature film is shown. This was to enable a more streamlined process where an episode could be edited in a day rather than taking an entire month to complete. Gunther, how about you? How do you prepare for filming an episode? Gunther: My role is to come up with a script for the show whether it is writing out skits to perform or researching trivia on the film that we’re going to show. Then, I guess you’d say that I “dress” the set by picking out the weird background items that are sitting around behind me as I host the show. You’ve both branched out into magazines and comics over the last couple of years. What have you done so far and where can people find your work? Joel: At this time, The Basement Sublet of Horror magazine is currently finishing up the sixth issue, while the comic book hasn’t progressed past issue number two. 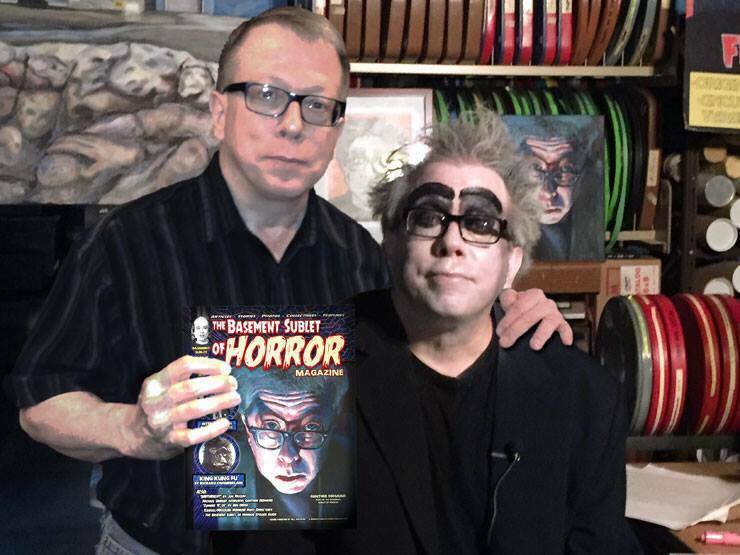 All publications can be purchased through the shows website at www.basementsubletofhorror.com. Joel, you’re also celebrating an even bigger milestone this year. How many years have you been involved in production? Tell us a little bit about what came before your association with Gunther and what you’d like to accomplish in the future. Joel: Yes, this will be the tenth anniversary of The Basement Sublet of Horror on June 13th of this year (2016). If you include the previous movie show versions, I’ve been working on this project since 1989, somewhere around 25 years. It’s been a lot of work and effort, but it’s really all been worth it to meet so many people and to hopefully entertain the audiences too. Gunther made his first appearance in 1984 before the first movie shows originally began as he co-hosted a midnight movie at Wichita State University with then KAKE-TV host, Gustopher Glitch. The show originated on Lawrence public access television. But where is it being broadcast now? And what is in store for the future of the show? Joel: The show is available for viewing through several places, through archive.org, Vimeo, or Roku (on the BetaMax TV channel), and on our main website. The only two stations still broadcasting the show are WRCT in Pennsylvania and on CATS in Bloomington, Indiana (check their websites for listings). The future of the show is to keep on bringing more bad movies to the BSOH audience, we’ve got a running list of the movies that have become available, enough to keep us around for a number of years to come. Keep checking our website, we’re always interested in new things and I’m sure there will be more projects or publications on the way. Thank you gentlemen for joining us today. Any final words of appreciation or wisdom you’d like to share with the readers? Joel: Thanks for talking with us Richard, we appreciate you taking the time to allow us to speak about the show. Words of wisdom, if you believe in something strongly enough, keep working at it and success will come your way. We’d like to also like to take a moment to thank Tim Manning (Basement Sublet of Horror cameraman), Bradley Beard (artist), Jim Erickson (Wichita movie host), and my wife Kris Hermanson for all of the support throughout the year. Gunther: Thank you all for watching! It’s been a really great ten years. I hope there’s much more to come for you. Thank you gentlemen! And readers, be sure you go to The Basement Sublet of Horror section on archive.org for a special 10th anniversary episode 322. 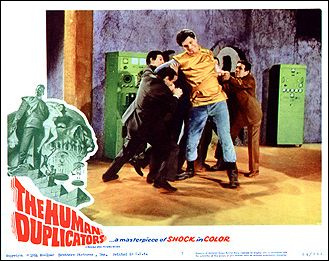 Gunther is presenting The Human Duplicators (1965) starring Richard Kiel and Hugh Beaumont, a perfect way to celebrate 10 years of monster goodness! Happy Anniversary Joel and Gunther!